In recent years there has been a heightened awareness that consuming undercooked meats present a risk for exposure to potentially deadly infectious organisms. In contrast, there has been a resurgence of interest in feeding cats raw diets. Advocates stress the fact that in their wild state animals eat uncooked and unprocessed foods. The reasoning I’ve heard is, “It closely approximates the diet cats would get in the wild—the diet to which their physiology is naturally attuned.” Wild cats do eat a varied diet in the wild including organs, brains, small mammals, birds, fish, snakes other reptiles, insects and occasionally stomach and intestines of mice and other rodents. Some people believe that raw food or so called “BARF” diets are better for pets because the food is not processed and is perceived to approximate a cat’s evolutionary “natural” diet. Though there may be some nutritional value to feeding raw foods or eating them ourselves there are significant health concerns to be aware of that make this diet dangerous. Just because wild animals eat raw meats does not imply that these foods are safe! What’s dangerous about a raw diet? 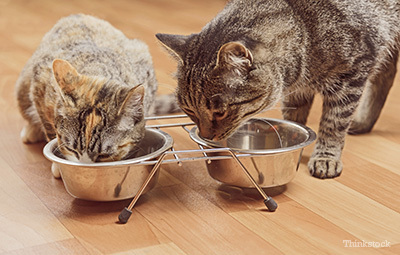 What do the experts say about feeding pets raw diets? The American Veterinary Medical Association policy (AVMA) adopted a policy statement addressing the issue in 2012 opposing the feeding of raw foods. The American Animal Hospital Association (AAHA) approved a policy in August 2012 that discourages feeding raw meat to pets. The Centers for Disease Control and Prevention (CDC) does not recommend feeding raw foods to a pet because of the risk of food-borne infection to the pet and to household members. Any modest benefits to consuming raw foods are overwhelmingly undercut by the risk of diseases that can be avoided simply by cooking. Don’t animals sense when food is spoiled or unsafe? I know a lot of people eat raw vegetables and some who eat meat raw or nearly so. Is that dangerous? I can’t help but believe that the digestive processes of cats have evolved as they have at least in some if not all domesticated cats. They have allergies now that may not have existed in their ancestors. Good post!! Sharing!